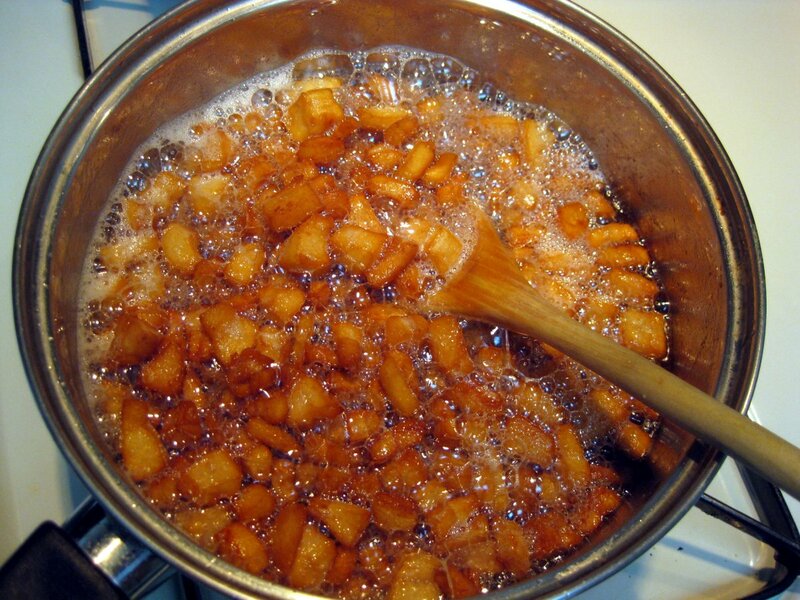 The national dish of Slovakia is bryndza potato dumplings, bryndzové halušky. But it’s not just the bryndza cheese that gives them their delicious flavor. The taste comes from pork cracklings (oškvarky in Slovak, škvarky in Czech, but I grew up calling them the latter) and the rendered lard (masť) that is mixed in before serving. The big issue that comes up when making pork cracklings in the USA is that it is difficult to find unsliced cured bacon (slanina). 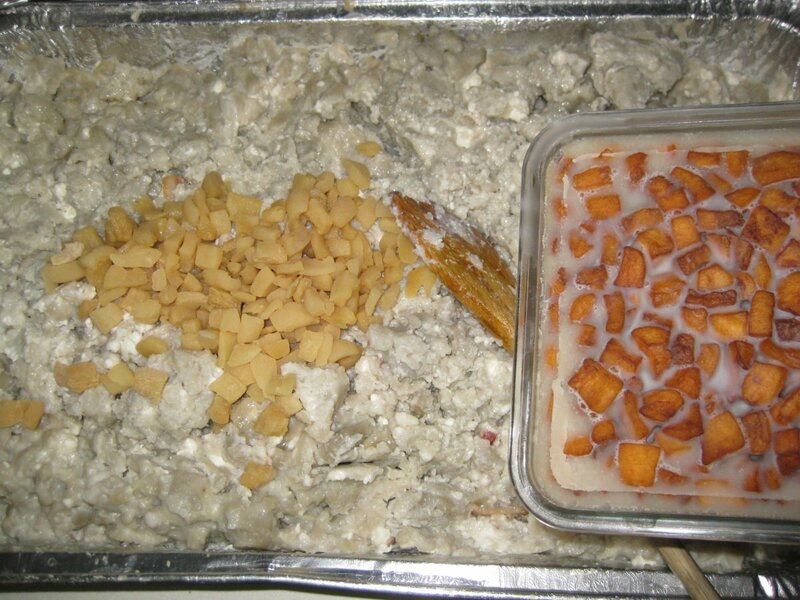 In Slovakia, cracklings are typically made during the annual pig slaughter, when the whole family gets together to dress a pig, and turn it into sausages, head cheese, and bacon. I tried looking for a fatty pork belly in a Chinese grocery store but with no luck. I found the belly, but it was too lean. Hence I got really excited few weeks ago when I found, completely accidentally, that my local Giant supermarket carries slices of cured pork back rind. I could finally make the right kind of bacon bits to top my halušky! I started by washing off the salt used to cure these rind (skin) slices. 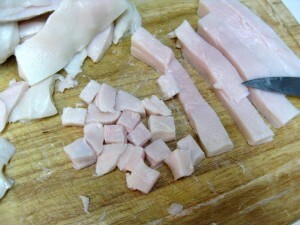 I next cut the skin off and sliced the fat into cubes about inch on each side. Alternatively, make them brick-shaped. Be careful when slicing the skin off so you don’t cut yourself. Greasy bacon and a sharp knife is a bad combination. Place them in a pot along with a quarter cup of water. The water is put in so the bottom pieces don’t burn before enough fat is rendered. Back in September, the Czech American TV ran a program about making these cracklings. 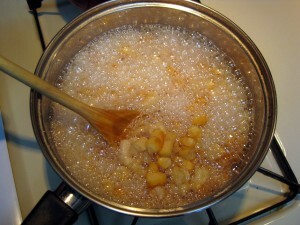 In that recipe, they suggested to add milk (mlieko). So I figured I’ll give that a shot and poured in about quarter cup of milk. Stir well and add salt if needed. Turned the heat off and immediately remove the cracklings. 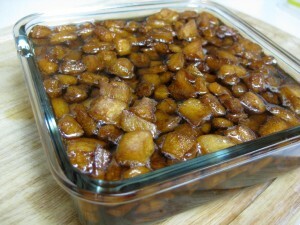 As mentioned in this Slovak cracklings-making video, they’ll turn into charcoals if you don’t take them out right away. 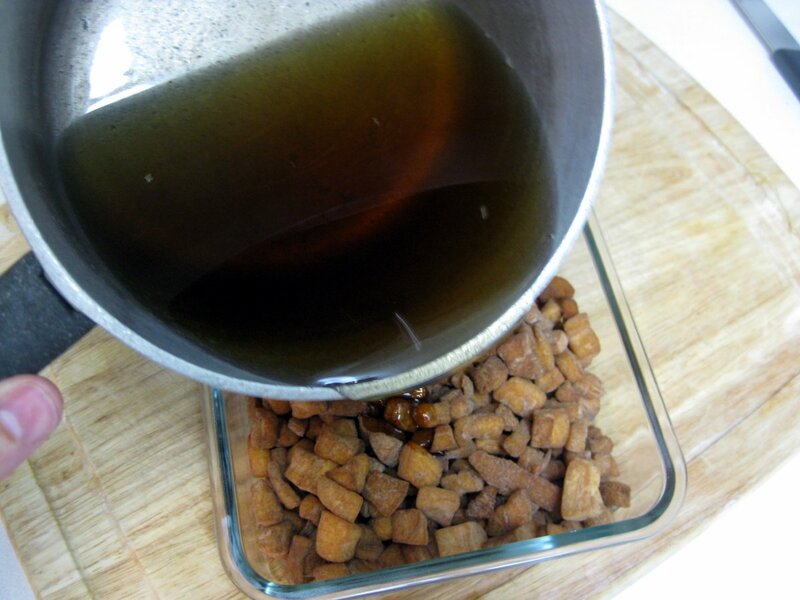 Save the fat – this is the most delicious part! Since there may be little burned pieces floating in it, you may want to filter it first. 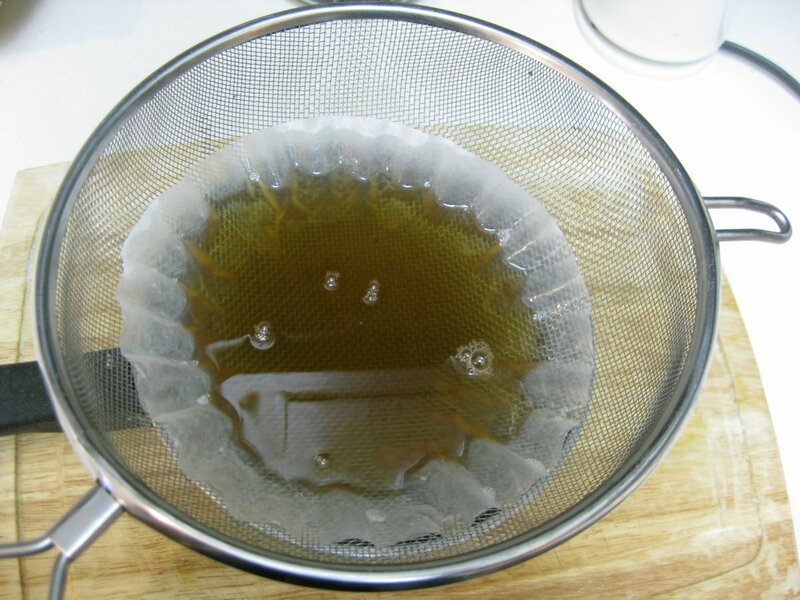 I found that a coffee filter works well. Just place it in a strainer, and place that over a pot. 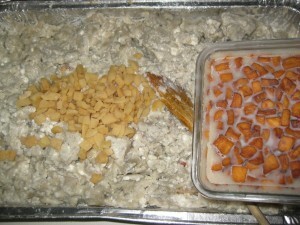 It will take half an hour for the lard to make it’s way through. Then place your škvarky in a container and pour the lard in. 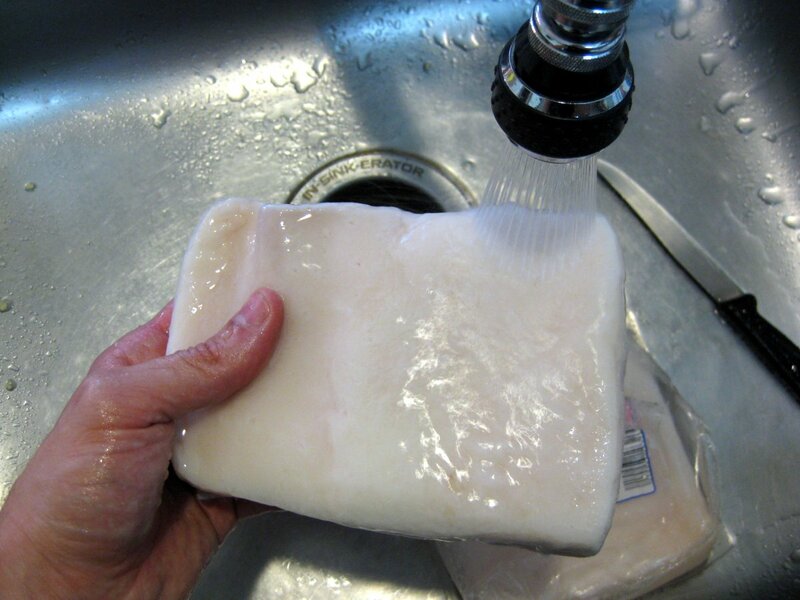 Place in a fridge to let the fat solidify. 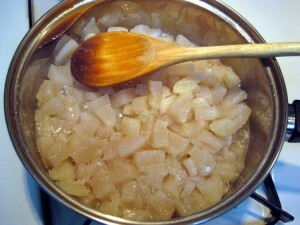 When making halušky or pierogi, just scoop out few tablespoons and heat up in a frying pan. 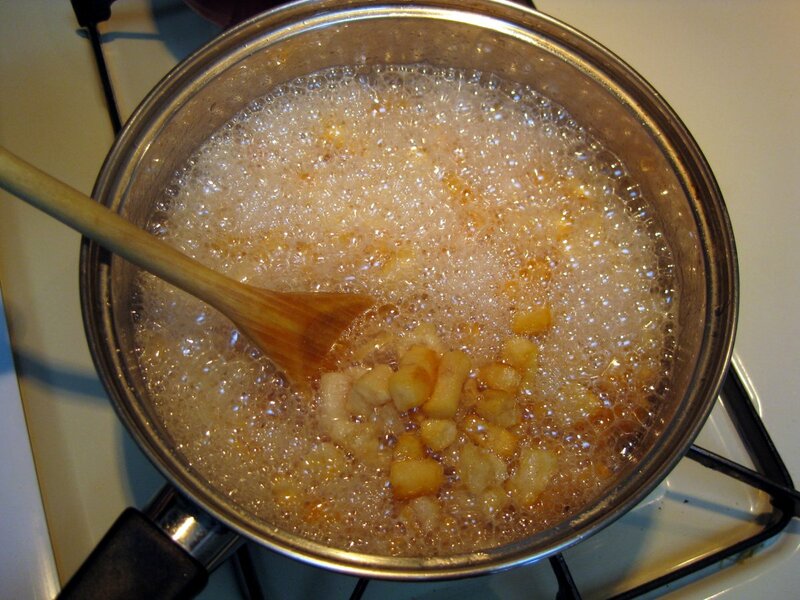 The rendered lard (masť) without the bacon bits also makes for a delicious substitute for butter. I got curious to find out why the Czech TV recipe called for milk – I have not heard of this before (I am not alone, a similar discussion in Slovak on this forum). So I made another batch without the milk. The result were cracklings much lighter in color. It appears that addition of little bit of milk gives the cracklings their deliciously brown color. You can also see here how the fat solidifies. This photo shows one of the batches of halušky made for the Czech and Slovak Christmas Bazaar in Bethesda, MD this past weekend. 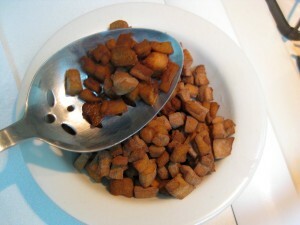 How do you make pork cracklings (skvarky)? Do you leave the skin on? Taky davam obcas mleko ,ale je to pouze pokud nemam pivo ,myslim ,ze s pivem /lager/ je to lepsi !! To: Lubo …ja osobne to delam pul na pul ..usetrim si pracu a navic mam “kozaky ” moc rad. BTW mleko nepo pivo ,az na konec !!!!!!!!!!!!!!!!! Pivo – hmmm, I like! Ahhh, this has brought back lots of memories. 🙂 My folks make them just like you do and they add a bit of milk as well. 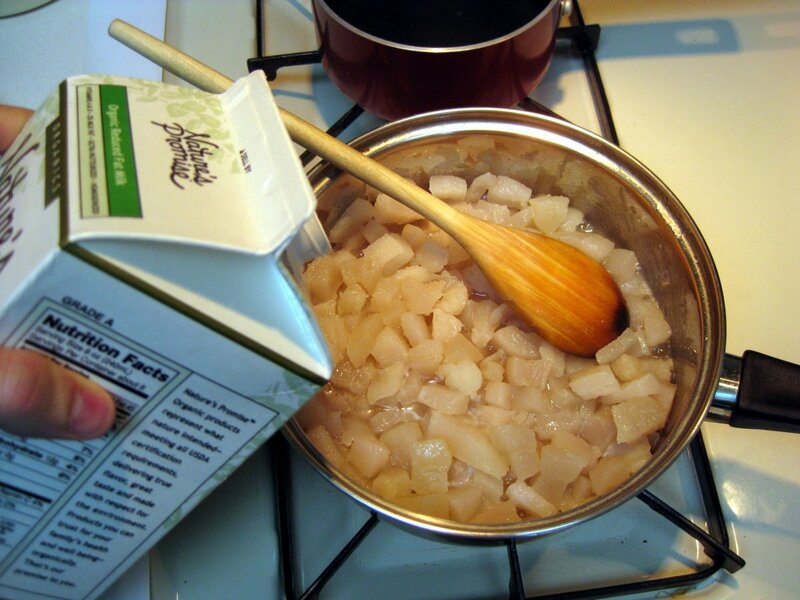 Generally we don’t pour lard over them but keep them separate-perfect to grab a handful for a filling snack. 😀 . Excellent enjoyed with a hunk of bread and some salad. I remember as a child when my mom used to buy huge amount of that fat meat at butcher’s. then cut in pieces, not as small as yours, bigger and then slowly cooked in the huge pot. She added the milk, too. After it was cooked, she squeezed more fat out of oskvarky to get more lard out(she had special kitchen utensil for it, she also squeezed potatoes for lokse with it). Lard was used for cooking and oskvarky were used for making spread(ground in meat grinder with onions, adding ground pepper) or for oskvarkove pagace.Those were so delicious with cup of hot tea. Hey FoodBuzz friend! I love your blog! Keep up the good work. Visit mine sometime. And in Slovakia these savoury cakes are called Skvarkove pagace or Pagatche (possibly the closest English transcription of the word), which would loosely translate as Pork Cracklings cakes. Can you use the part of salt pork instead? I am so glad to have found your page. This was an anticipated snack whenever we had pork chops for dinner. 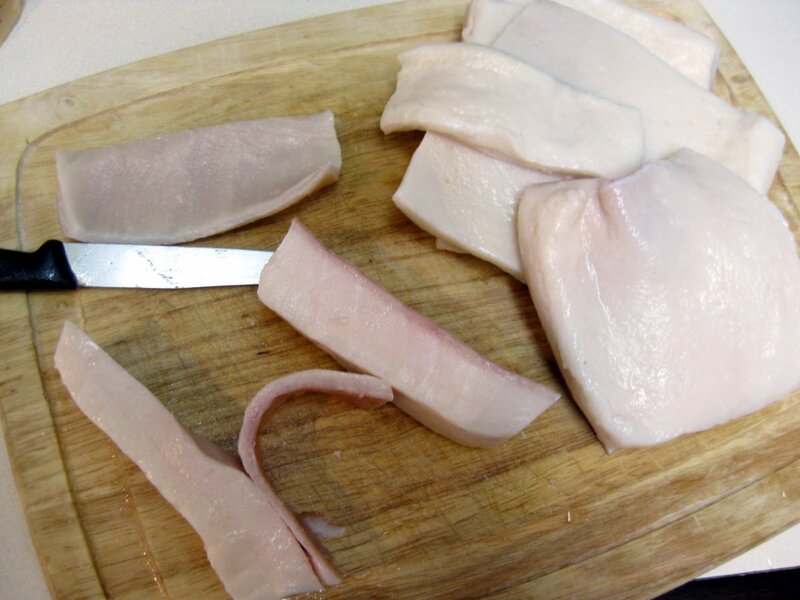 My mom would pick out chops that had enough fat along the edges then she’d trim it off and cut it into 1/4 to 1/2″ cubes, season with garlic powder and pepper and render it down slowly. She never put water or milk in them, just started them low until there was enough grease to turn them up. She sprinkler salt on them after she had them draining in the bowl w paper towel. When we had a pork roast (back in the day when they still left a layer of fat on top!) my brother and I would fight to make sure neither of us got more than the other! When I took Slovak classes at Pitt I remember being so happy to find out “shkvarkey” was a real word, not just something my mother made up! !